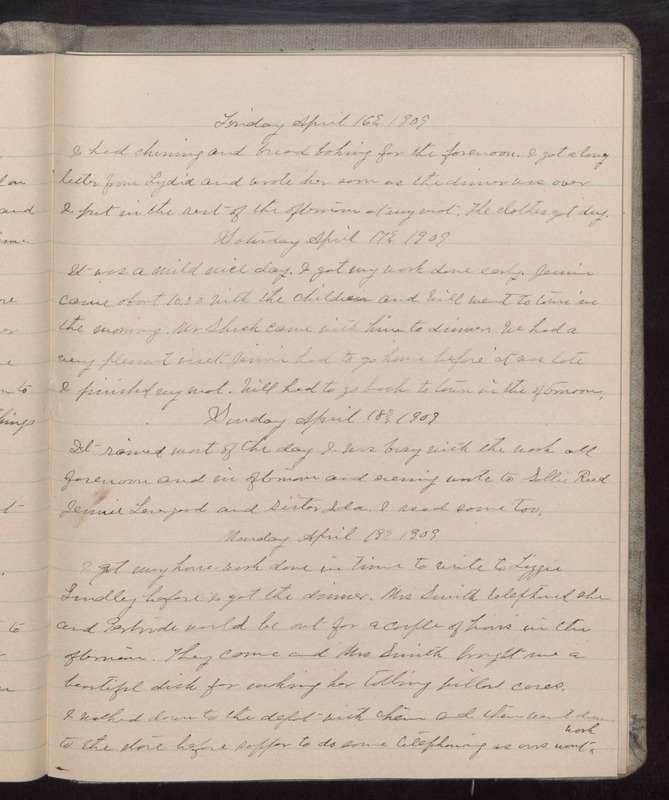 Friday April 16 1909 I had churning and bread baking for the forenoon. I got a long letter from Lydia and wrote her soon as the dinner was over I put in the rest of the afternoon at my mat. The clothes got dry. Saturday April 17 1909 It was a mild nice day. I got my work done early. Jennie came about 10.30 with the children and Will went to town in the morning. Mr Shick came with him to dinner We had a very pleasant visit. Jennie had to go home before it was late I finished my mat. Will had to go back to town in the afternoon. Sunday April 18 1909 It rained most of the day I was busy with the work all forenoon and in afternoon and evening wrote to Sallie Reed Jennie [Levgood?] and Sister Ida. I read some too. Monday April 18 1909 I got my house-work down in time to write to Lizzie Lindley before I got the dinner. Mrs Smith telephoned she and Gertrude would be out for a couple of hours in the afternoon. They came and Mrs Smith brought me a beautiful dish for working her tatting pillow cases. I walked down to the depot with them and then went down to the store before supper to do some telephoning as ours won't work.